Thanks Florence. I haven’t read all her books and I noticed some of her fans didn’t like it as much as other series but I liked it. Maybe it’s all a matter of degree. I hope you enjoy it. Hi Olga. I actually started reading “Midnight” this weekend. I tend to agree with your great review. 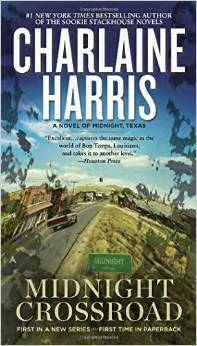 However, I was a little uncertain about the book at first, because it failed to immediately draw me into the story the way Harris’ other books do. But curiosity pushed me forward, and after several short chapters, I was hooked. The characters are intriguing and appealing to me. Thanks for your feedback within this review. PS: Now i’m curious to read at least the first “Harper Connelly” books where the Manfred character is supposed to have begun. I haven’t read any of these but this is a third review I’ve come across. They have all said the same things: a great read. Must put this one on the back burner. Thanks for this intriguing review, Olga. Thanks Teagan and Tess. Yes, I’ve read in the comments that Manfred came from another story. I think Bobo too. Let me know what you think. The problem with the beginning is the catalogue of places and characters but it does build up. Keep me posted!